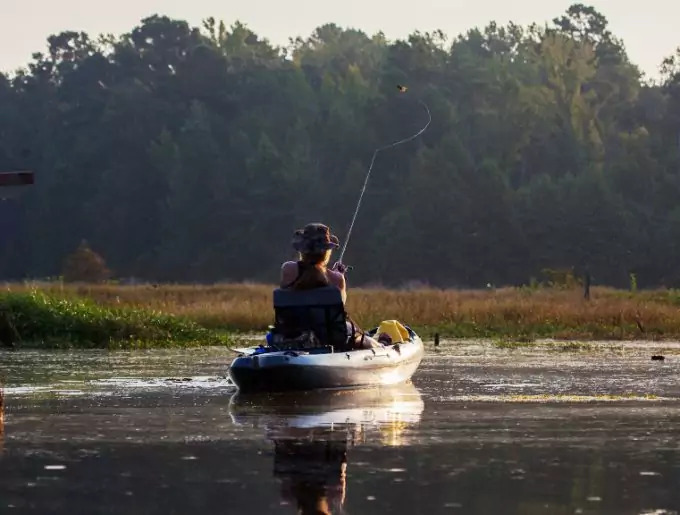 Having the best kayak for fishing can make all the difference in the world, especially for those who are avid fishermen. Nothing can be more satisfying than taking your catch back to your camp and roasting it open and over fire for dinner. But you can’t do that if you don’t have the right means of transportation to get you to your catch. Many people prefer fishing from a power boat, but you can’t always haul that heavy thing behind you all the way to your campsite from home. Kayaks, instead, are much lighter, have no moving parts, and don’t require fuel. That means that you’ll have even less tools to bring with you to keep it maintained, which is a good thing if you intend to travel light. When looking for the best fishing kayak, they can come in one of two varieties: angler (they’re already rigged) or stock (you rig it yourself). Rigging your kayak helps to customize it to your specifications and needs so that you can make the most out of your fishing experience. The great thing about kayaks is that they can be used in a variety of bodies of water, from the ocean to lakes to streams and ponds. 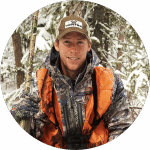 However, it’s the gear that you equip your kayak with that will make all the difference and help you catch those elusive fish. It’s your purpose that should be kept in mind when considering the kind of kayak you should get. This will help you plan the kind of gear you should take and whether your kayak is equipped to carry it all. Although the kayak is simple in its construction, they are all built differently according to what you need. Longer kayaks tend to be a lot faster than shorter ones, but are you able to strap something that large to the top of your vehicle? Wider kayaks are more stable and are less likely to roll over with movement. Some kayaks are even equipped with “rockers” that allow them to do well in waves, but perform poorly on flat water. 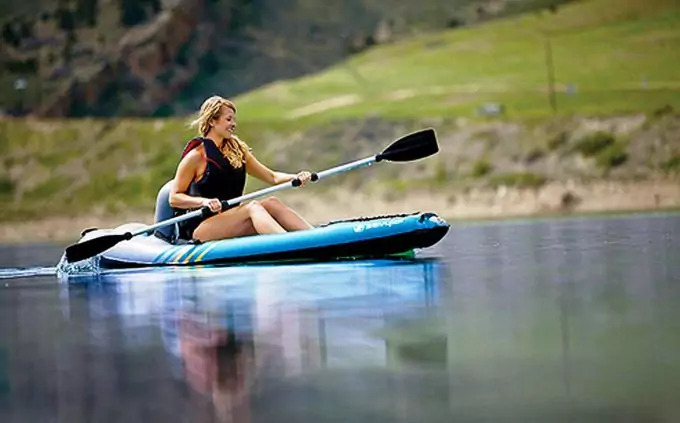 And even if you do find a kayak that suits your needs, you may find that it ends up being a lot slower than you imagine as your confidence and experience are developed the longer you use your kayak. Be prepared to have to shell out money in the future to invest in a new kayak as your paddling arms get stronger and stronger. When it comes to kayaks, there are two kinds of seating options: inside or on top. 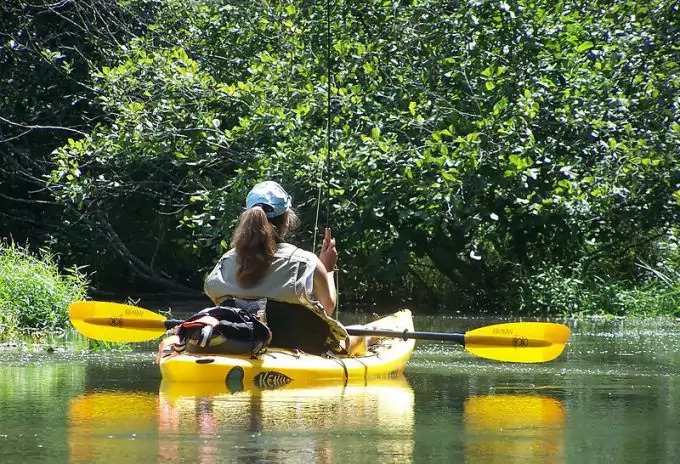 Most anglers tend to go for seating on top, as it’s much easier for them to move around, access their tools, add accessories to their kayak, and to get out and wade to shore if they need to. However, this can make paddling an extremely wet experience, and not everyone is equipped to deal with getting wet. That’s why the “cockpit” style of seating may be a better option for some. These are much better for those who are fishing in cold water. Another added benefit is that you’re inside the boat, your center of gravity is much lower and you’re less likely to fall out. You may have some trouble turning around to reach your equipment however, so there are pros and cons to both kinds of seating arrangements. Kayaks are available in a wide range of color, and for a supposedly good reason. Many fishermen will tell you that it helps to blend into your environment in order to make it more difficult for the fish to see you, but science has recently proven that fish don’t see as many colors as we do, and that in their environment, they can see even less. However, they do pay more attention to shadows. Some will suggest getting blue to blend in with the sky overhead, or other colors such as camouflage or sand to blend in with your surroundings. Others suggest that you get colors that make you more visible to other people on the off chance that you have emergency and need to be found. In this respect, yellow, orange and red are the colors you want to go with. What color you choose is really up to you. Once picking your kayak is complete, you’ll have to figure out some way to get it home or to your campsite, as well as know how to store it when it’s not in use. Wherever you buy your kayak from will probably have the tools you need to help you get your kayak around. If you purchase it in person, then the dealer can help you to figure out the best means to strap your kayak to your vehicle and ensure that it doesn’t fall off. Getting your kayak home should be easy enough after that, but you need to find somewhere to store it. Leaving it on your vehicle until you’re ready for your camping trip may seem like a good idea, but it’s not the best thing you can do for your boat. You can store it in your garage or even outside, but there are plenty of online stores that provide storage solutions that keep your kayak out of the sun and heat. Rigging is the means of customizing your kayak to suit your means. Some kayaks already come rigged, but nothing’s more satisfying than taking a stock kayak and transforming it into something that is uniquely you. 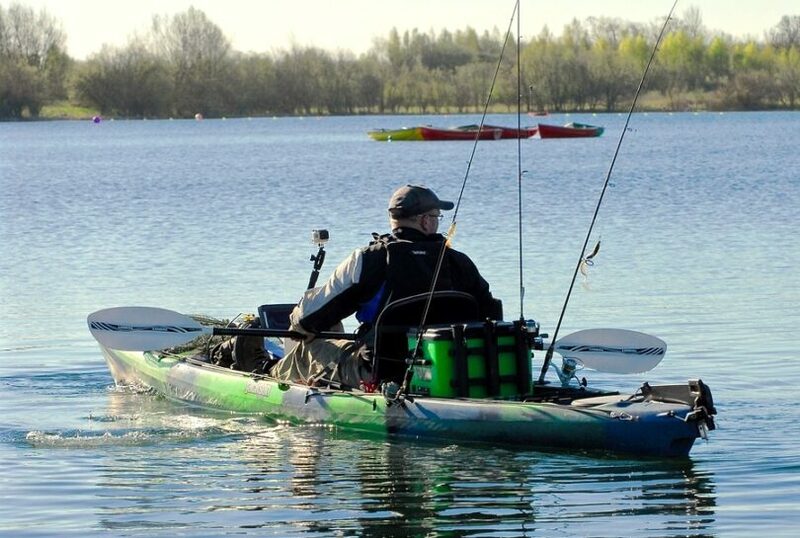 Stock kayaks are cheaper anyway, and can help you to save money on making the best fishing kayak you’ll ever need. It’s not recommended for those who are new to kayaks and aren’t comfortable with power tools. Before you decide to start cutting and drilling into your kayak, however, it’s best that you take it out first so you can get a sense of where your installations should be that would be most comfortable. Adding a rod holder in the wrong place can make it more troublesome for you to get your paddles. Always check your measurements twice before you start drilling into things to ensure everything is correct. For tips and tricks on how to select the best fishing rods, see our article on this important topic. However, if this isn’t your cup of tea, then you’d be better off buying a pre-rigged kayak, where all of the accessories are already in convenient locations for most fishermen. You’re not going to get very far without some reliable paddles at your side, and the more you pay, the more reliable they’ll be. The dealer may be able to recommend some good paddles to you, but the best ones you can go for are the lightest that you can afford. Heavy paddles can wear you down much more quickly and make your fishing experience less enjoyable. Another good thing to invest in is a paddle leash. This keeps your paddle strapped to you or your boat so that you’re less likely to lose them while you’re fishing. This happens more often than you think, especially when you’re in the heat of the moment wrangling a fish and you’ve forgotten all about your paddles. It’s too late when you’ve caught one of the biggest catches of the season but have no way of getting back to show it off to the rest of your friends. Price can be a very important factor for those who aren’t looking to have the top of the line on the market. Going for the best features may seem the best goal to aim for when it comes to price, but it’s more about your comfort level. How often are you going to use the boat every year? Are you really going to use every single feature that it comes with? Are you going to upgrade in the future to a new kayak? Would you prefer customizing your kayak to suit your needs? These are all questions you should take into consideration instead of looking at the price tag. If you’re not going to be using your fishing kayak very often, then it might be best for you to go for the cheapest one that you can afford, especially if it’s your first kayak, and worry about getting the “perfect” one once you’ve gotten some experience with it. The great thing about kayaks is that they retain their value extremely well, so you can expect to get close to what you paid for it. Also, the best time to buy a kayak is in the fall when stores are looking to clean out their inventory and there aren’t a lot of people invested on getting one very soon. These kayaks will be marked down, allowing you to save more money than purchasing it during prime kayaking season in the spring. When in doubt, always consult the experts before you purchase. Finding a kayak shop or a sporting goods store can be a fountain of information that can help you make the best purchasing decision. 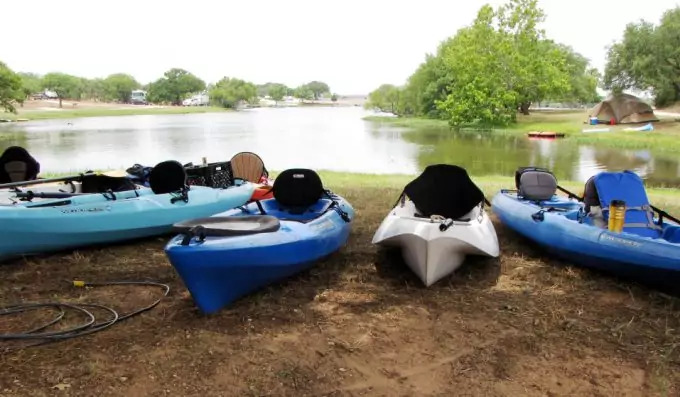 Many of them may allow you to rent a kayak and then apply part of the fee towards the purchase of that kayak, so that you can get a feel for what does and doesn’t work for you. If you’re really new to kayaking, they can even show you the best ways to paddle that don’t overexert you while you’re fishing. Another options is to hire a guide to take you kayak fishing. They can provide you with a kayak that’s already rigged for fishing so that you can be familiar with where everything is. Some people may consider this option to be pricey, but i’s definitely worth it for the amount that you’ll learn on one trip. You’ll not only learn how to use all the gear, but you’ll also get a feeling for the best places to throw your line in order to maximize your fishing potential. Much like purchasing a car, there are benefits and disadvantages to buying a new versus an old vehicle. But unlike a car, kayaks are much more versatile and are less likely to be “lemons.” And if they are, you’re going to be able to see it right away. New boats are fresh off the line, and you know exactly what you’re getting when you buy one. They’ve never been used and have no wear or tear on them that will make them fail when you least expect it. And if something does go wrong, the warranty will cover everything so that you don’t have to shell money out of pocket to get it fixed. On the other hand, they tend to be more expensive and if they’re new to the market, there won’t be a lot of information or reviews about their functionality. For used boats, however, you can find some great deals if they’ve been lightly used. They’re not only cheaper, but you can get some great advice from the person that’s selling it. If you do decide to go this route, then be sure to check the kayak for signs of damage. 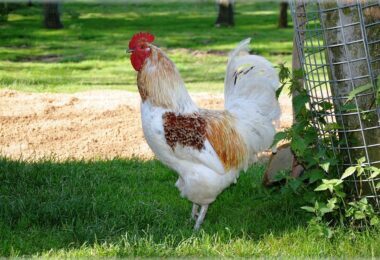 Ask why the owner is getting rid of it as well as follow up questions so that you know exactly what you’re getting into. 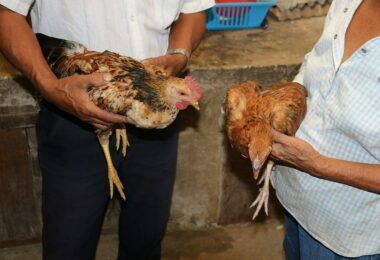 Other things to look for are whether the serial number has been removed, whether it has been registered, and if the owner has any of the original paperwork, including the warranty and where it was made. If possible, ask if you can take the kayak out for a test run so that you can see if it’s the right fit for you. Many of these sellers are simply upgrading to another kayak and want to get rid of their old one. See also our best fishing apps for mobile phones to make the activity more enjoyable. Now that you know what you should be looking for in a fishing kayak, here are a few recommendations of some of the best kayaks in the market. This is a two-person, inflatable kayak, so it’s easy to pack away and store in a smaller area than a hard plastic kayak. It’s affordable for beginning kayakers, and was built with quality in mind, so it’s not going to break on its first use. It has inflatable seats as well, with adjustable back rests so that you can find the right comfort level just for you. It includes oars, a hand pump, valves for quick inflation, grab lines, a duffel bag to carry it in, and repair kits when those pesky punctures occur. You can use it straight out of the box, so you can minimize on space when you’re going camping and/or fishing. It’s quite stable for an inflatable kayak as well, so you’ll have less chances of falling over or capsizing. And because there are two separate air chambers, your kayak isn’t going to deflate if there is a puncture. This is definitely a package that anyone who’s interested in kayaking should invest in, since it comes with everything that you need. You’ll also be surprised by the spaciousness of the kayak, as most inflatables are only made with seating in mind and room for nothing else. This way, you can bring your poles and tackle box with you without having to worry about hanging them off the side of your kayak. You’ll even have space for a lunch box as well if you want to eat while you’re fishing. This isn’t to say that this kayak isn’t without some drawbacks. The aluminum paddles are built to be sturdy, but it’s surprising that since it was built with family activities in mind that they aren’t adjustable. They’re 84″ long, which may be too much for a child to use effectively. You may have to purchase smaller paddles if you plan on fishing with children. Also, be aware of the plastic connectors on the side that are designed to hold your paddles. Many have reported that they are prone to breaking, so you may end up losing your paddles when you least expect it. Another drawback is the bottom of the kayak. It’s a black color, which absorbs a lot of heat and sunlight on a bright day. This can lead to the kayak expanding, resulting in over inflation and punctures occurring over its body. 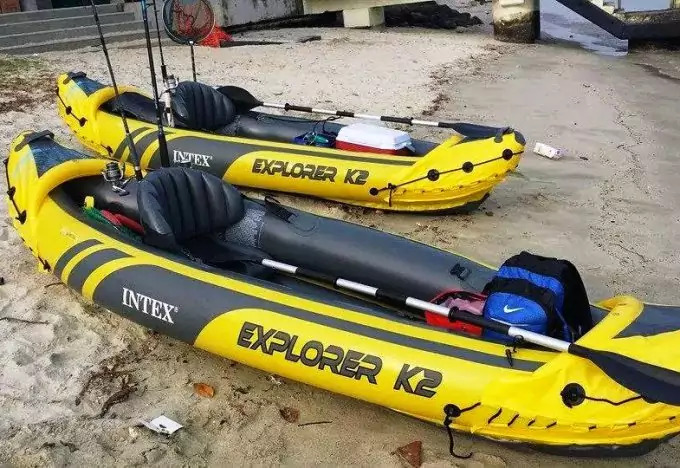 All in all, the Intex Explorer K2 was designed with family friendliness in mind and serves as a good first starter for those who are just getting into kayaking. At the affordable price, you get a lot for your dollar, but you may want to upgrade eventually due to its propensity for slow leaks and punctures. You’d never think that an inflatable kayak would be capable of carrying 650 lbs., but the Sea Eagle does just that. It’s capable of carrying all your gear and a travel partner, so you can continue to have fun fishing with company. But just because it can carry a hefty amount of weight doesn’t mean you’ll have to break your back to carry it. It deflates, making it extremely portable and lightweight, while still maintaining excellent speeds while it’s out on the open water. 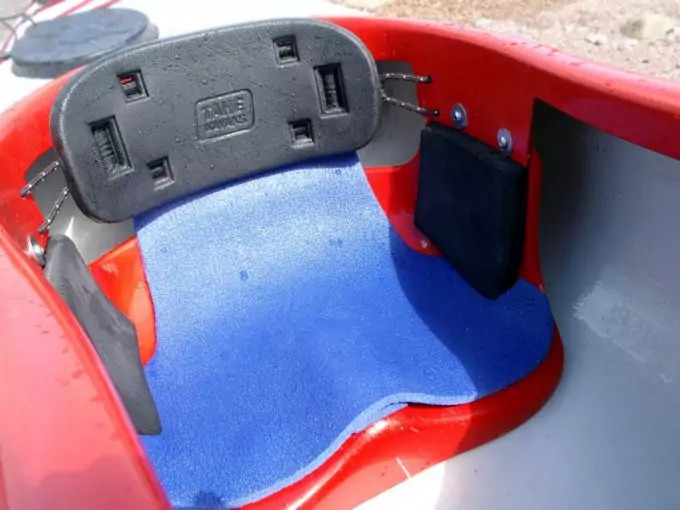 It features a five-tube construction, and has the seat positioned in a way that distributes it evenly throughout the body of the kayak. The rigidity of the floor is enhanced with an I-beam constructed from large tubes, so you’ll never have to worry about the bottom of your kayak giving in. What makes the Sea Eagle even more desirable is that it comes equipped with two molded skegs so that your boat won’t weave aimlessly while you’re paddling. This allows you to expend less energy getting your kayak to where you need it to go. 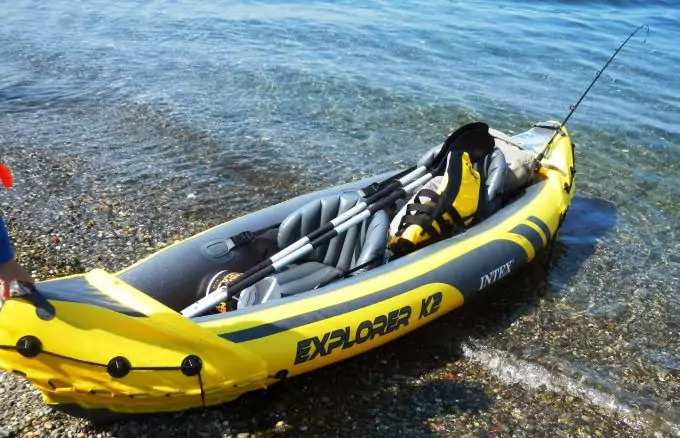 It has an efficient valve system that prevents air from leaking out, and the structure of the kayak has tear-resistant properties, allowing it to last longer even when it comes into contact with rocks or other sharp objects. Additives have been made to the material as well, so that it can withstand gasoline, oil, and UV rays, just to name a few. The only real downsides to this inflatable kayak is that the carry bag only has one strap, which can make it difficult to carry around, and the paddles can’t be stored in the bag, meaning that you might have an awkward time getting your kayak down to the water. If you’re looking for a way to get your kayak to your campsite without having to tie it to the roof, then this is one inflatable kayak for you. The Quikpak K1 was designed to make it fun for families or individuals to have fun on any body of water, while remaining safe. It’s easy to set up, and even the children will have a fun time paddling around in it. And when you’re done, you can let the air out and store it in the trunk of your car when you’re ready to go. The kayak comes with an attachable cargo net at the front so you can store your personal belongings without taking up too much space in the seating area. There are also cup holders, so you can stay hydrated while you’re waiting for those fish to bite. The seating space provides a lot of leg room, so you can stretch out and relax, and provides a more comfortable experience or taller users. The kayak only requires about five minutes setting up, allowing you to spend more time fishing and less time pumping air into its body. It can even be inflated easily by just one person without causing too much exhaustion. And the paddle it comes with is also collapsible, making it easy for you to store everything together. The carrying bag makes this even easier by taking the form of a backpack, complete with shoulder straps. It’s not bulky either, so you can carry it from one site to the next without much hassle. But even though it’s lightweight, that doesn’t mean that it will tear easily. It has a Tarpauline bottom that can withstand punctures and tears from logs, rocks, and seaweed. The material of the kayak is thick and reinforced against any leaks that may occur. However, this is a drawback from its light weight, as it doesn’t really withstand heavy waves and strong breezes. You may need to bring some extra weight with you in order to keep your kayak stable while you’re out on the water. It’s a good starter kayak, but you might be better investing in something heavier and more stable in the future. Space is always an important feature to keep in mind when investing in a kayak, and the Malibu definitely provides a lot of it. It’s designed to hold up to 425 pounds, and still provides a lot of space for the other things you want to take with you while you’re fishing. There are two adult seats and a third one for a child, making it perfect for families. The seats can be adjusted for comfort while still providing you with a lot of leg room to relax and stretch out. The seats can even be moved around when you’re paddling by yourself while still providing you with optimum paddling capabilities. But not only is it roomy, it’s also safe. It has a stable hull and deck design, especially for its sit-on-top seating. 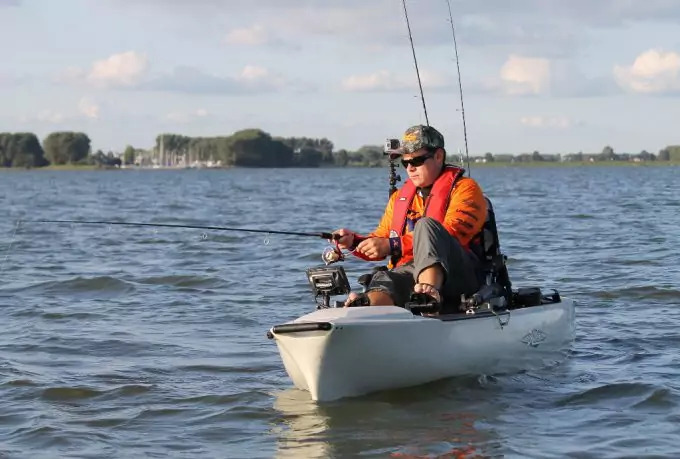 The construction of it allows for it to be differentiated from other kayaks on the market, so you’ll definitely stand out on the lake when there are other fishermen about. It was also designed with stability in mind, so that it can quickly regain balance, even in the toughest of waves. Don’t forget to read our reviews of the best handheld GPS for fishing to easily find your favorite spot. A few drawbacks to this kayak are the color choice and the narrow width, so you may not be able to spread out as much as you want. And like all sit-on-top kayaks, you’re likely to get more wet on your trips than with docked seating. 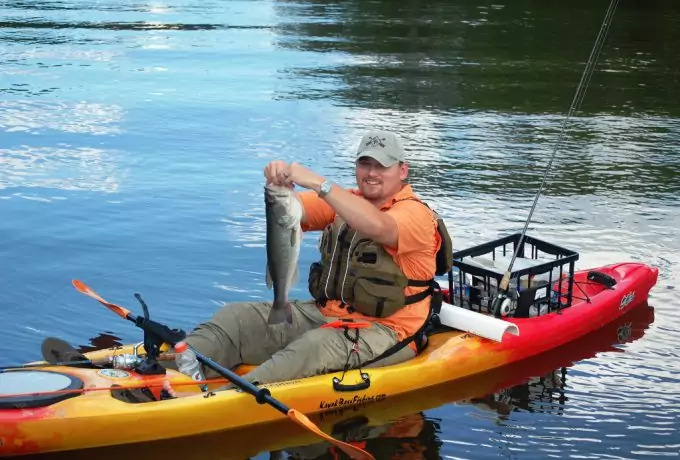 This kayak is great for flat waters and lakes, so you can have a smooth and peaceful ride while you’re out looking for those fish to catch for dinner. It’s a great choice for families too, and you won’t have to worry about the burden of paddling all by yourself with its lightweight design. It has a Tri For hull that allows for better tracking and steadiness, and the design makes it easy to stack, which is great if you plan on buying more than one of the same kayak. The adjustable padded seat and multiple molded footwells provide comfort while you paddle, and will eliminate that pesky back fatigue that can come with getting around all day. The Frenzy is also only 9 feet long and weighs about 43 pounds, so transportation should be easy enough on the hood of your car with a few bungee cords, not to mention the carrying handles on the bow and sterns sides. The bungee cords on the front and rear of the kayak allow you to take your tools and gear with you, so you won’t have to take up prime seating just to fit them all. There are also scupper holes to prevent your kayak from flooding, and the aluminum paddle is collapsible for easy storage. Plan on going out on a fishing trip with you and your friends? Worried that you won’t have a lot of space for everyone and that someone’s going to be left behind or have to paddle by themselves? 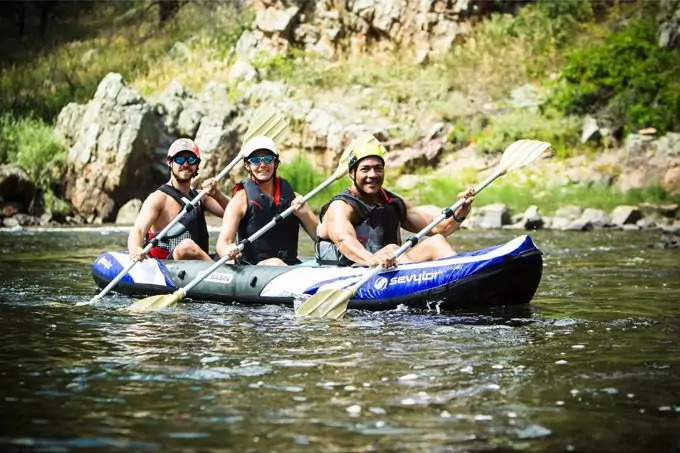 The Big Basin 3-Person kayak allows for everyone to have fun together while staying safe and comfortable. It can hold up to 490 pounds, enough for three adults. 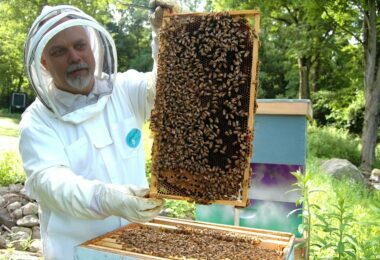 This is due to its massive size, but that doesn’t mean it’s going to be heavy; it only weighs about 35 pounds. It has PVC sides and a Tarpaulin bottom for stability and durability, minimizing the chances of any punctures occurring. It’s also leak free, with multiple air chambers that keep your kayak inflated even when there is a tear. The kayak is also easy to use and easy to inflate, with double-threaded Boston valves that get the job done quickly. it even comes with a pressure gauge to ensure you’re not overinflating your kayak and causing unintentional tears in the material. And if you’re worried about storage, it comes with a backpack that makes it easy to carry your kayak to and from the shore. No more lugging around a hard plastic body or tying it down to the top of your car. The adjustable seats ensure comfort, allowing for you to find the right seating positions so you don’t hurt your back during extended sessions of paddling. Many have considered the Big Basin to be one of the most stable kayaks in the market, even with three people on board. 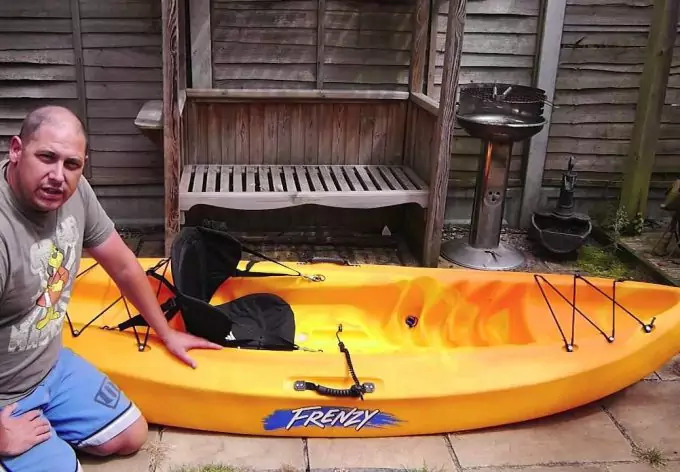 However, one downside to this kayak is that there are no pumps or paddles included, meaning that you’ll have to spend extra money to get your own. That’s a strange choice to make, given that the majority of inflatable kayaks come with these accessories. This kayak also wasn’t built to be used on the ocean, as it’s not very capable at handling the rougher waves of the sea. Those who use it have also said that you’ll have a hard time getting the kayak dry before you store it, allowing for bacteria to grow between the folds of the material if it hasn’t been dried properly. When using your kayak, regardless if you’re a good swimmer or not, it’s always a good idea to take life vests with you on your fishing trip, as you may never tell what can happen. Some starter kayaks may come with these, but you may have to invest in them separately. It’s not a purchase you should skip out on, especially if you want to stay safe during your venture. Take as many life vests as the number of people that are going with you on your fishing trip. Before your next fishing trip, see our article on useful tips and guidelines on choosing fishing kayaks.